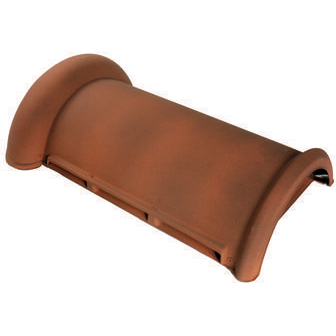 Designed to replace a normal ridge tile, TV3N Ridgeline Vent is available to match all popular ridge tiles. Extracting from the highest point of the roof can increase the efficiency of airflow giving ridge ventilation significant advantages over other types of ventilation. Hold ridge vent in position and mark the underfelt directly below the ridge vent outlet. Cut and remove the underlay as marked. Bed ridge vents in mortar in a similar manner to the standard ridges. Nail the retaining straps to rafters/ridge board. Complete ridge in normal manner. If using pipe adaptor, clip felt sleeve and attach CTIC flexitube, after fitting into roof.